British Pop singer Sting has a song titled "History will teach us nothing." In contrast, James W. Shepherd said: "If God overrules in human affairs and teaches man by means of history, then he who faithfully records historic facts fulfills an important service in the education of men." I believe God values history. After all, what is the point of Passover and the Lord's Supper, if not to remember? Remembering the past is not living in the past. Instead, it is understanding how the past impacts the present. lt is to be inspired to greater faithfulness by the lives of godly people who went before. lt is to appreciate a spiritual heritage so that it will be properly valued. lt is about gaining a perspective that liberates one from the "tyranny of the contemporary" as Elton Trueblood called it. 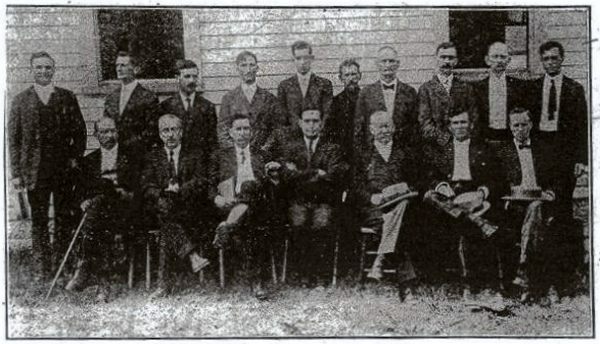 This site shares the fruit of some research on the Restoration Movement in the Upper Ohio Valley in the first half of the 2Oth century. Necessarily, it is inextricably tied to Restoration studies in the 19th century as weil as Church history studies. 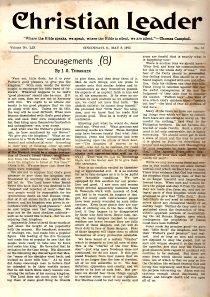 The primary source for research has been the Christian Leader, an influential journal based in the Ohio Valley.